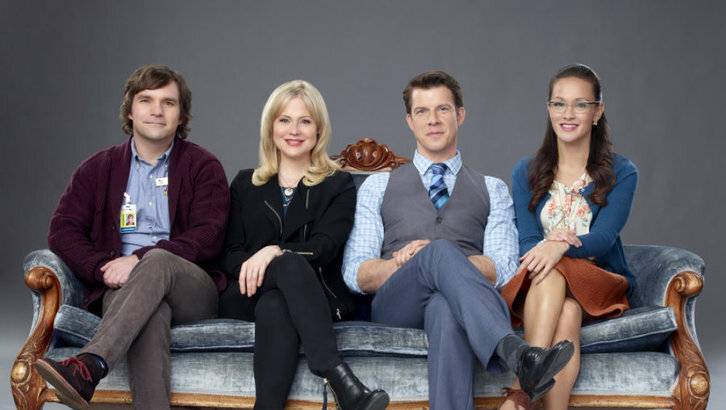 It was just over a year ago that I first spoke to “Touched by an Angel” creator Martha Williamson about her dead letter detective series for Hallmark, “Signed, Sealed, Delivered.” She is one of my all-time favorite interviews, making me feel like an instant old friend, and it was a delight to catch up with her about the series’ new expanded format as feature-length films for the Hallmark Movies & Mysteries Channel. Tell me about the challenges of the new format. I’m loving this because we have essentially a whole story now. We were doing the series that was originally going to be about dead letters being delivered late but the life of this quirky little group just took on more of a role. People embraced them so much and just fell in love with the two little love stories between Oliver and Shane and Rita and Norman and wanted more of the backstories of these folks and their lives. I would never compare myself in any way to “Mad Men.” But a guy wrote something brilliant about how in that show the characters take on their own lives and you have to follow their own lives and that’s kind of what I find myself doing. We have these amazing characters in these great actors who embodied them so well that you just kind of have to follow these characters and see where they wanted to go. And as a result we discovered that it was so much more satisfying to make movies. And Hallmark had this new Movies & Mysteries channel that they wanted to do. I’m not a mystery writer per se but every letter is inherently a mystery in one form or another. These people are postal detectives, which actually exists. But they really became this little family. And so I found that we needed extra time and Hallmark really wanted us to go to the Movies and Mysteries. It is turning out to be very gratifying. We’re actually shooting one right now in Vancouver and I’m writing the second one, then there is a third one as well. I’ll stay on the set and write the next one. It’s really a family experience. Some of the actors will walk off the set and say “How’s it coming?” and I’ll say “Oh man! What do you think Oliver would do if we were here?” He always wants to do the right thing and I think he struggles. So it becomes this group discussion because everyone so invested in it. And we’re really having a lot of fun. I have to say it’s just perfect for me, too. I’m the mother of two teenage girls and doing a series as you know is all-consuming but to be able to have this freedom of writing a movie and then go shooting, writing a movie and go shooting, it all seems to be working out for everybody. I was excited to hear that we would find out more about Oliver’s wife, and delighted that Poppy Montgomery was cast in the role. Just brilliant, she was brilliant. The minute I met her I said, “Oh my gosh! You were Holly and I didn’t even know.” It is like I was writing for Poppy. I hate to imagine channeling because I don’t believe in channeling but it was as if I was writing for Poppy and she walked in and said, “This is my part.” It was just perfect. I’ll back up here having done so much about working with angels, all of a sudden, the thing about angels is angels don’t have to have faith because they know, they’ve been there, they know what’s true. People, human beings struggle with faith all the time because they haven’t seen. What was the line? “Blessed are the ones who see and believe but more blessed are the ones who believe without having seen.” That was the next step for me, was in writing, now how we supposed to live? What does it mean to live in faith? And I’m still so saddened when I see so many television shows who depict people of faith as rigid and so judgmental and so legalistic and so unforgiving when faith itself is based on forgiveness. Even I go back to “Mad Men” again in the finale the other night. When he showed up and he talked about Jesus, he looks like a fanatic creep. And it’s so disappointing even now and I felt like, why can’t we explore somebody like Oliver? A nice man who goes to church sings in the choir, tries to do the right thing based on the faith in which he has been raised and still finds himself as we all do unable to completely control the circumstances of our lives. How do you address that? I know that my father was divorced in 1940 and it was this horrible source of shame for him because nobody in the history of his family had ever been divorced. And here he was getting divorced and it just broke his heart. And yet he was this man of great faith and so how was he going to reconcile these two things. It does finally come down to just doing the best you can and trying to do the right thing and carry on. And so that’s who I think Oliver is. How do I take a show like this to churches and say this is a story about a guy whose wife has left him and moved the Paris and now they’re going to decide whether or not they’re going to get divorced? And I think that’s what really interesting to me is that he is working out his faith in front of an audience in fear and trembling and every day as we are all challenged with stuff. It’s not what happens. Its how we face it and how we deal with it. And Oliver is not bitter but he also knows what he has to have. I think my favorite line is when Oliver and Poppy finally sit down for their come to Jesus conversation. She tells him they realized how completely different they were. They got married for maybe the wrong reasons and their whole faith systems, their whole value systems are very different and finally she says, “What do you want?” and he says, “Peace.” And she in her sort of hippie, new agey way goes, “Oh that’s beautiful” and he goes, “No that’s essential, I need peace”. And I think he realizes that she can’t give it to him. Peace is not something that she can give to him, he’s going to have to take it. And that’s true I think for all of us, nobody else can give us peace, we have to make those choices for ourselves. And I’m excited about it; it is very sweet and loving but surprisingly honest conversation. Poppy is just perfect and she knocks it out at the park because she’s isn’t crazy, she does not play crazy person. She just sees it as: this is exciting and something fun and I’m going to write a poem about this and I’m going to go to Paris. And this is a guy who does have parameters in his life and he does want to live according to a certain code and it doesn’t make him intractable and it doesn’t make him judgmental. There is nothing wrong with trying to do the right thing and I think somewhere along the way we somehow confused self-awareness with self permission. Yes we want to be happy but not when it hurt other people. I love Eric Mabius as Oliver. He shows us that Oliver tries to find the order and certainty and closure in his job that he does not have in his life. That’s exactly right. Oliver is like a lost letter himself. Once that Holly situation is resolved it opens up to the real painful stuff he has to deal with in his past. So that becomes why did he allow himself to be captured by this sprightly personality? Well because she was so fascinating she took him away. As she says, “Why did you marry me?” and he said, “Because I’ve never met anybody like you, you shook me up and I needed shaking up in my life. But the truth is I think we’ll find what it was doing was preventing him from actually having to deal with some deeper issues. It’s so wonderful to watch Eric at work. He locks up himself in his room and works on that script for days. When you have a chance to see this show pay attention to his face and you will realize at the end of the show that he never once repeated a facial expression. Every facial expression is unique to the moment; he doesn’t rely on the tried and the true reactions that you see in so many people. He carefully lays out the show and then like the best actors that I know then they throw it all away and let this happen and it becomes so fresh in the moment. He’s great! He’s just great, he is so much fun to watch. The 1980’s cartoon series “Jem and the Holograms” is now a movie! It stars that Aubrey Peeples as Jem, Stefanie Scott as Kimber, Hayley Kiyoko as Aja, Aurora Perrineau as Shana, and Ryan Guzman as Rio, and it is scheduled for release October 23, 2015. This new film from Nancy Meyers (“It’s Complicated,” “Something’s Got to Give”) stars Anne Hathaway as a young executive with a new intern played by Robert De Niro. 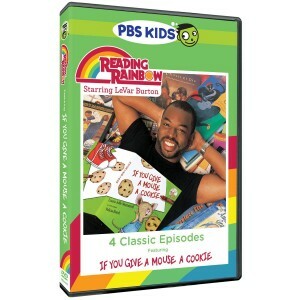 Levar Burton and Reading Rainbow present four classic episodes on this new DVD from PBS Kids. 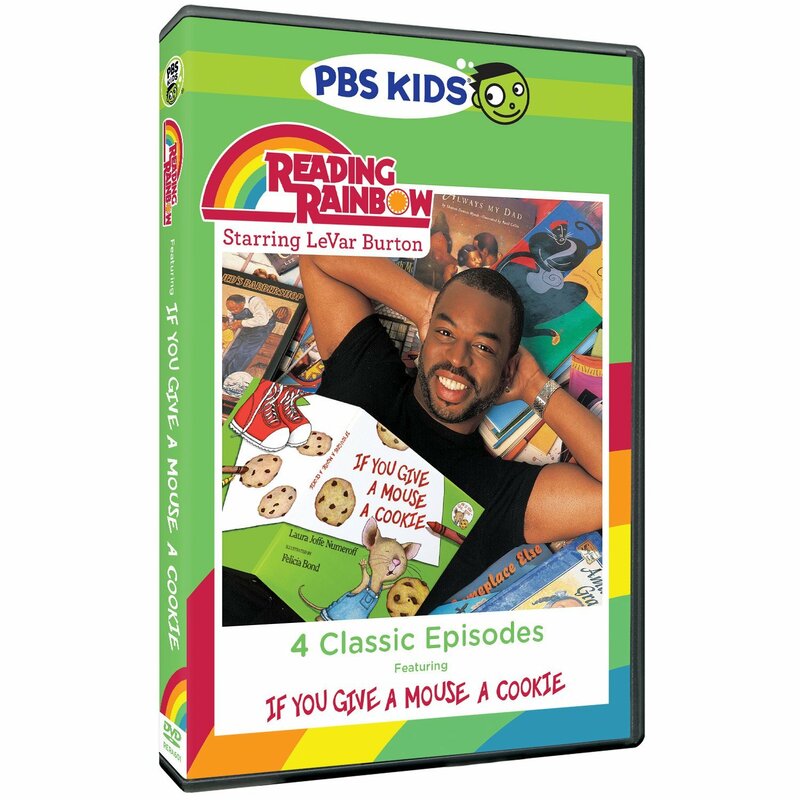 If You Give a Mouse a Cookie read by Beth Howland, Owen read by Matthew Broderick, Two OId Potatoes and Me read by Jordan Puryear, and Mr. George Baker read by Wayne Brady. I’m especially fond of the last one, the story of a 100-year-old man and a first grader who are both learning to read for the first time. Send me an email at moviemom@moviemom.com with Rainbow in the subject line and tell me your favorite book for beginning readers. Don’t forget your address! (U.S. addresses only). I’ll pick a winner at random on June 7, 2015. Good luck!